Note: The work was re-fabricated with four 21-inch LCD displays and computer-controlled sensors for the exhibition “Sons et Lumières, Une Histoire du son dans l’art du Xxe Siècle,” at the Centre Georges Pompidou, Paris, France, September 22, 2004 – January 3, 2005. 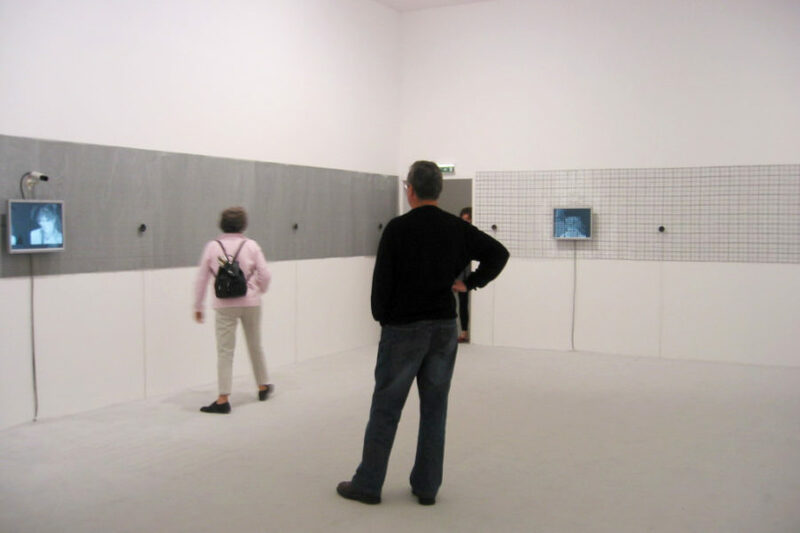 This work involves interactive components that capture images of the viewers and move them through four black-and-white monitors wall-mounted and positioned around the perimeter of an square/rectangular space. 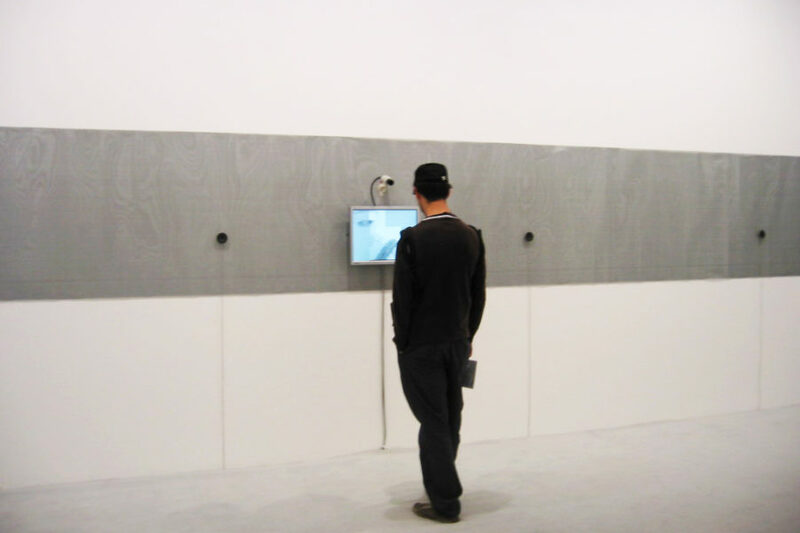 As one enters the space a camera mounted above the first visible monitor is the source of the generation of a still frame (a portrait of a person who has just entered the space). With each new person’s entrance another still is generated and the previous is sent to the next monitor in the space followed by the next person and so on. Two other video cameras are mounted above two of the monitors on opposing walls of the space. As viewers explore the piece, their images, visible as pixilated grids, are further articulated by varying resolutions and further processing of its visible horizontal and vertical structure. 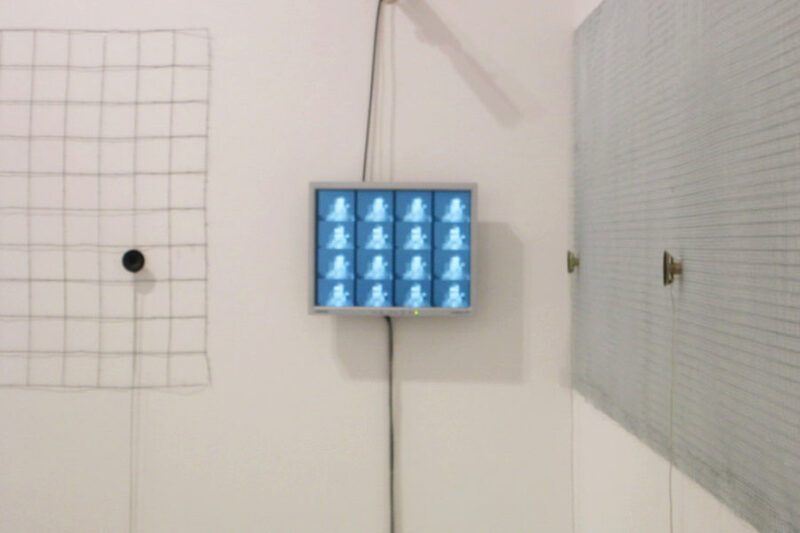 The time frame of movement and processing of the image is controlled by viewers’ entries into the space, movement within the space, and their exits. 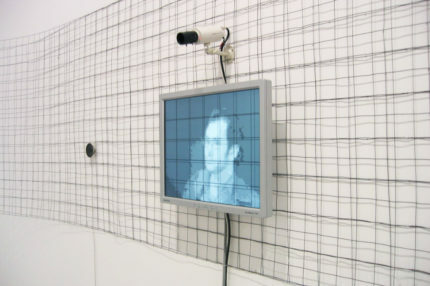 The cycling images and their pixilated, grid-like motif are reinforced by two other elements of the piece: layers of wire mesh in varying gauges which are mounted along each wall, and electronic sounds – multiple frequencies of square wave generators – that pan around all four walls of the space. 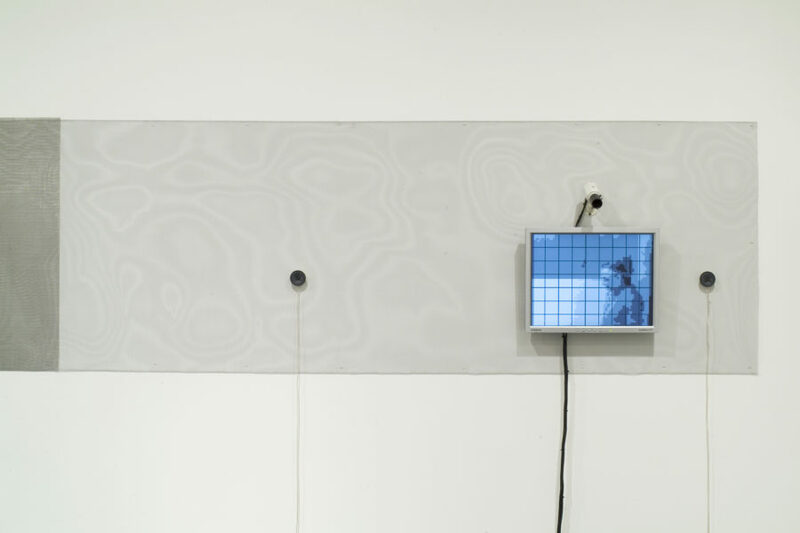 Relationships between the frequencies of the sound, the variations of the gauge of the wire mesh, and the video images reinforce the physicality between the media. An example of this work was first exhibited in a solo exhibition at the Everson Museum of Art, Syracuse, New York, May 11-June 30, 1979. Solo exhibition. The Kitchen Center for Music, Video and Dance, New York, New York, November 27 – December 15, 1979. “Sons et Lumières, Une Histoire du son dans l’art du Xxe Siècle,” Centre Georges Pompidou, Paris, France, September 22, 2004 – January 3, 2005. Note: The work was exhibited using four flat panel displays and other equipment changes. “Gary Hill,” Donald Young Gallery, Chicago, Illinois, February 17 – April 15, 2006. “Video: Gary Hill – Mesh.” Everson Museum of Art Bulletin, Syracuse, New York (May 1979), unpaginated. Wooster, Ann-Sargent. “Mesh.” Village Voice (December 17, 1979). Furlong, Lucinda. “A Manner of Speaking: An Interview with Gary Hill.” Afterimage 10, 8 (March 1983), pp. 11, 12, 14. Gary Hill. Selected Videography. Program notes. Tokyo: JICS Plaza Video and International Community Services, 1984, unpaginated. The Situated Image. San Diego: Mandeville Gallery, University of California, San Diego, 1987, p. 4. Sarrazin, Stephen. Chimaera Monographe No. 10 (Gary Hill). Montbéliard, France: Centre International de Création Vidéo Montbéliard, Belfort, 1992, pp. 39, 82. (Including an excerpt from an interview with Gary Hill). Van Assche, Christine. Gary Hill. Paris: Editions du Centre Georges Pompidou, 1992, p. 87. Mignot, Dorine. Gary Hill. Amsterdam: Stedelijk Museum; Vienna: Kunsthalle Wien, 1993, pp. 49, 54. Van Assche, Christine and Corinne Diserens. Gary Hill. Valencia: Instituto Valenciano de Arte Moderno (IVAM), Centre del Carme, 1993, pp. 91, 99. Klangkunst - Sonambiente festival für hören und sehen. Berlin: Akademie der Kunste, 1996, p. 70. Morgan, Robert C., ed. Gary Hill. Baltimore: PAJ Books / The Johns Hopkins University Press, 2000, pp. 82, 190, 191, 199, 220. Gary Hill: Selected Works and catalogue raisonné. Wolfsburg: Kunstmuseum Wolfsburg, 2002, pp. 65, 77. Sons et Lumières, Une Histoire du son dans l’art du XXe Siècle. Paris: Éditions du Centre Pompidou, 2004, pp. 244 – 247. Quasha, George and Charles Stein. An Art of Limina: Gary Hill’s Works and Writings. Barcelona: Ediciones Polígrafa, 2009, pp. 24, 395, 584. Gagnon, Jean. “Gary Hill à la recherche de la perte technologique / An Interview with Gary Hill.” artpress 2: Arts Technologiques - Conservation et Restauration (February/March/April 2009), pp. 10 – 21. (French and English).